Primary cutaneous adenoid cystic carcinoma (PCACC) is an extremely rare tumor, which predominates in the face/head/neck, particularly in the salivary glands and is associated with characteristic histological features. In many tissue including the salivary glands, breast, esophagus, auditory canal, breast, uterus, cervix, bartholin gland, prostate, and skin this condition has been reported. PCACC affects men and women equally, and the etiology remains uncertain. Initial diagnosis of PCACC progresses slowly, expanding, firm, skin-colored nodule with locally invasive. To our knowledge, this is the first case of PCACC describing dermatoscopic features of this rare condition. Adenoid cystic carcinoma (ACC) is a non-common malignant tumor of salivary glands that exhibits aggressive infiltrate growth. ACC most often occurs in major and minor salivary glands of the head and neck. It can rarely occur in trachea, bronchi, esophagus, auditory canal, breast, uterus, cervix, bartholin gland, prostate and skin. Recurrence of ACC is frequent. Lung, liver, bone and brain are the most common sites of metastasis. PCACC originates from the eccrine and apocrine glands. Histologically, PCACC shows cribriform pattern. Tubular and solid patterns are also be defined. PCACC consists of epithelial and myoepithelial cells. Perineural invasion increases the risk of recurrence and is an important prognostic cause. The histopathological finding of the incisional biopsy material of our case was consistent with PCACC. Dermatoscopic examination revealed follicular openings, distinct skin lines and star-like images on erythematous background. Here, we present 73-yearold female patient with PCACC with typically dermoscopic features of PCACC. A 73 year old female patient was admitted to the dermatology outpatient clinic because of painful swelling on the back. According to her story two years ago, as redness on her back gradually became rigid, it had begun to ache. Her medical history was unremarkable except spinal surgery. Routine tests were normal. There was no lymphadenopathy detected in systemic examination. The patient did not accept detailed radiological examination because of the lack of complaints. No pathology was detected on follow-up for 4 years. Dermatological examination revealed painful lesion on the lumbar region of the back sized 2 cm × 1.5 cm × 0.3 mm (Figure 1). Figure 1: Painful lesion on the lumbar region of the back. Dermoscopic findings of the lesion include follicular openings, distinct skin lines and star-like images (Figure 2). Biopsy obtained from lesion showed large and small cribriform islands made of basaloid cells. Immunohistochemical markers including p63 and calponin were diffuse positive in peripheral myoepithelial cells of the tumor islands (Figures 3 and 4). Recurrence was not observed after total excision of lesion. Figure 2: Follicular openings, distinct skin lines and star-like structure. 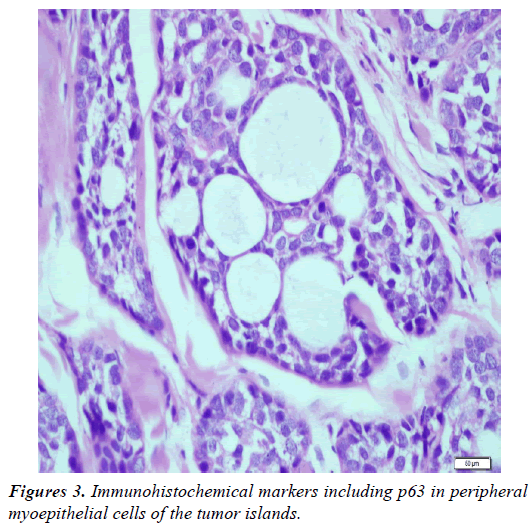 Figure 3: Immunohistochemical markers including p63 in peripheral myoepithelial cells of the tumor islands. Figure 4: Immunohistochemical markers including calponin in peripheral myoepithelial cells of the tumor islands. ACC is a malignant tumor of salivary glands which is usually found on the head or neck . Moreover, PCACC is slowly expanding nodular lesion on the head. It is a rare tumor, noticed and described for the first time by Boggio in 1975 . It is usually seen in people over 50 years of age, affecting men and women equally . Local recurrence is about 50% after excision . ACC may originate from eccrine glands or ducts. On the other hand, auditory canal is free from eccrine gland, but is another site where ACC can be seen. This leads to the hypothesis that, tumor may occur in many different tissues and organs. Thus, it is considered that tumors in different locations have similar histologic features . However, salivary glands on head and neck region must get examined before ACC is diagnosed. Histologically, tumor cells are present in lobules made of epitheloid cells in cystic and cribriform pattern in ACC. Histopathological findings of our patient, large and small cribriform islands composed from basaloid cells and immunohistochemical markers including p63 and calponin diffuse positive in peripheral myoepithelial cells of the tumor islands were consistent with ACC. Half of patients have perineural invasion. PCACC may mimic adenoid basal cell carcinoma (ABCC) and mucinous carcinoma. PCACC and ABCC are both rich for multiple cystic lobules and mucinous in adenoid and cribriform pattern. In ABCC tumor cells may have connection with epidermis. Perineural invasion is rare in ABCC. Peripheral palisading and retraction artifact are present and stroma may have more cells . Immunohistochemical studies may aid in further differentiating adenoid BCC from ACC. For instance immunohistochemically, in contrast to adenoid BCC, cutaneous ACC often stains positively for S-100, epithelial membrane antigen (EMA) and carcinoembryonic antigen (CEA). Mucinous carcinoma of the skin which typically shows islands of basaloid eccrine cells embedded in lakes or pools of mucin separated by fibrous septa. The mucin is hyaluronidase resistant and sialidase labile, indicating that it is a sialomucin, as apposed to the hyaluronic acid seen in cutaneous ACC . Thus, metastasis of PCACC is relatively lower (10%) than other locations of tumor, where minimally surgical excision is suggested. There is no consensus on treatment due to lack of cases and short duration of follow-up . In PCACC, standard treatments are wide-local excision or mohs micrographic surgery. Radiotherapy may contribute as an adjuvant treatment. Cisplatin and fluorouracil combination therapy has reported as successful treatment option in a PCACC case with lung metastasis . Our patient underwent wide local excision procedure. We present this extremely rare case of ACC with clinical and dermoscopic findings. Dermoscopic features of ACC may play important role for early diagnosis and treatment. Fueston JC, Gloster HM, Mutasim DF. Primary cutaneous adenoid cystic carcinoma: A case report and literature review. Cutis 2006; 77: 157-160. Terada T. Pigmented adenoid cystic carcinoma of the ear skin arising from the epidermis: A case report with immunohistochemical studies. Int J Clin Exp Pathol 2012; 5: 254-259. Boggio R. Adenoid cystic carcinoma of the scalp. Arch Dermatol 1975; 111: 793-794. Lestouquet FR, Sa'nchez Moya AI, Honorato Guerra S, et al. Primary cutaneous adenoid cystic carcinoma: An unusual case. Dermatol Online J 2013; 19: 5. Weekly M, Lydiatt DD, Lydiatt WM, et al. Primary cutaneous adenoid cystic carcinoma metastatic to cervical lymph nodes. Head Neck. 2000; 22: 84-86. Chang SE, Ahn SJ, Choi JH, et al. Primary adenoid cystic carcinoma of skin with lung metastasis. J Am Acad Dermatol 1999; 40: 640-642. Yaohui GX, Hinshaw M, Longley BJ, et al. Cutaneous adenoid cystic carcinoma with perineural invasion treated by mohs micrographic surgery- A case report with literature review. J Oncol 2010; 1-5. Numajiri T, Nishino K, Uenaka M. Giant primary cutaneous adenoid cystic carcinoma of the perineum: Histological and radiological correlations. Acta Derma Venereol 2008; 88: 316-318. Krishnamurthy A, Vaidhyanathan A. Primary cutaneous adenoid cystic carcinoma of scalp. Int J of Head Neck Surg 2010; 1: 179-181.